1. Will DAWGS damage my property? No. Because of our unique installation process, DAWGS do not damage your doorways, windows or building in any way. 2. Can I install DAWGS myself? No. DAWGS door and window guards can only be installed and taken down by one of our professionally trained crews, who can be on site whenever you need them. This ensures that the building is fully secured without causing any damage. 3. Can I purchase DAWGS equipment? While DAWGS equipment is only available on a rental basis, we offer both short and long-term arrangements. Rentals range from three months to multi-year arrangements, with the possibility for extensions, just in case. 4. Will DAWGS fit on any window or door? Absolutely. We use a unique modular design that allows us to accommodate windows and doors of virtually all shapes and sizes. 5. What if the property isn’t vacant yet? We can provide quotes even on properties that aren’t vacant. Our installation crews can be on site whenever you need them, and we’ll coordinate with you on any impending move-outs or evictions. 6. Can I work inside a building with DAWGS on it? Of course. Our door guard systems allow you to enter the building while safely securing you inside, and our window systems are ventilated to provide fresh air and sunlight. 7. Can my contractors work around a DAWGS system? What if they need it taken down for a job? Contractors can continue to work inside the property with the added benefit of having the security in place. If you ever need a DAWG taken down temporarily, we’ll get you an installation team within 24 hours. Our services are available at a reasonable rate, making it faster and easier for you to get the job finished. 8. What if I make changes to the building, like removing a porch? Can you adjust the DAWGS system? Yes. This modular system gives us the flexibility to accommodate any changes you make to the building during construction. 9. Do DAWGS block out air and sunlight? No. Our window guards are specially constructed to allow in natural light and fresh air. 10. How many DAWGS do I need? Do we need to secure the whole building? Every building is different, but when we give you a quote, we include any window and door on the ground floor and first floor. We also include any windows or openings that are easy to reach, like windows over the porch or facing adjacent buildings. 11. Can I still heat the building over the winter when DAWGS are installed? Yes. We can install insulation inside the window guards keeping the cold air out and allowing you to heat your building. 12. Can you clean DAWGS? What about graffiti? DAWGS are coated with a special powder that makes them easy to clean, including removing graffiti. 13. How long does it take to get DAWGS installed on my property? We know that security is a time-sensitive issue. Typically, we can have an installation crew on site within 1 or 2 days of your initial inquiry. Every building has different security needs, but when you contact us, we can be on site quickly to conduct an inspection and provide an accurate quote. 15. Do you have a keyless entry system? I may need people to access the property when I’m not there. Yes. 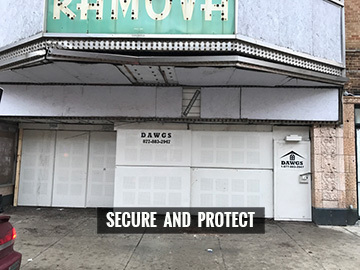 DAWGS door guards can be outfitted with a Frequent Access Security Tool (FAST) that allows anyone with access to open the tamper-proof lock without a key. 16. If we have an internal security breach, can you change the lock without changing the whole door? Yes. We can switch out the locking system on your door guards while leaving the door itself in place.